CFS Fire Protection, Inc. acknowledges their Fire Suppression Systems Service Manager with a Company Achievement Award for the Exemplary Performance of Duties in Commercial Fire Sprinkler Systems Protective Services rendered in 2018 throughout Northern California. Further information can be found at https://CFSFireProtection.com/. 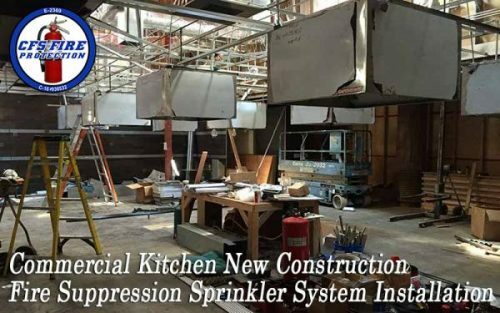 Sacramento, CA – In a slightly different approach to expanding its Fire Suppression Sprinkler Systems Inspection, Testing, Maintenance and Certification Services, CFS Fire Protection, Inc., a Commercial Fire Protection Service Provider in Northern California, has decided it will be internally celebrating the Fire Suppression Systems Service Manager with a Company Achievement Award, expected to take place the evening of February 2nd, 2019. Where most businesses tend to just do enough to get by or to make greater profit margins, CFS Fire Protection, Inc. has decided to go the extra mile and only provide High-Quality Services that is strategically achieved through quality hiring and specialized training of their employees. This process of vetting our staff creates truly Professional Customer Service oriented Licensed Fire Protection Technicians and the results are exuded by their Fire Suppression Systems Service Manager. Rory Bateman, Owner of CFS Fire Protection, Inc., says: “We wanted to recognize our Fire Protection Services Team, specifically our Services Manager, who wished to not to be named, for the exceptional work accomplished throughout 2018 within the Fire Suppression Sprinkler Systems Client Base. The Inspection, Testing, Maintenance and Certification Services for Commercial Sprinkler Fire Systems are extremely important to be accomplished on schedule and thoroughly because people’s lives are at stake. Although the attention to detail and accuracy of our services is mandated, maintaining the high-level of consistency all year without exception in 2018 is commendable. This is why we are showing our gratitude and appreciation for the fine job our Service Technicians and Service Managers are doing out in the field. CFS Fire Protection, Inc. has always made a point of standing out when compared to other Commercial Fire Protection Service providers in Northern California and this Appreciation and Exemplary Service Recognition Celebration is just one of the many ways it does so. This private celebration should be a great opportunity to build comradery within the CFS Fire Protection Team and is likely why everything runs as smoothly as it does for them. Everyone knows, a little celebration here and there helps keep the stress down and the work enthusiasm up and CFS Fire Protection, Inc. is no exception to this rule. CFS Fire Protection, Inc. has been serving Northern California Businesses from Fresno to Redding and San Francisco to Auburn, California, since 2007. To date it has served several hundreds of customers and has become recognized as a Professional Leader in the Commercial Sprinkler Fire Protection Services Industry, yet it seems their Customer Service and Work Ethics are what shines through their expanding Customer Base of Smiles. Further information about CFS Fire Protection, Inc. can be discovered at https://cfsfireprotection.com/. Organization: CFS Fire Protection, Inc.